The home secretary has unveiled plans to ban deactivated guns this year, on a visit to the Liverpool suburb where schoolboy Rhys Jones was murdered. Jacqui Smith said she wanted to protect the public and allow police to remove black-market firearms from the streets. Deactivated guns are not capable of firing live ammunition, but criminals often alter them for re-use. Ms Smith met the parents of 11-year-old Rhys, who was shot dead on 22 August while returning home. Gangs and gun crime, both prevalent in the area, were top of the agenda. Ms Smith said: "I want to balance protecting the public with the rights of responsible collectors of deactivated firearms. "I will shortly consult on a way forward to allow genuine curators to collect legitimate firearms while giving the police and other enforcement agencies the powers they need to get black-market firearms of our streets. "Tackling gun crime is key to making people feel safer and more secure in their communities. We already have the tightest controls in Europe but there is more we can do to remove the threat of gun crime." But Conservative Party leader David Cameron accused the home secretary of "complacency". "She has said gun crime is thankfully rare; in fact a gun crime is committed every hour in England and Wales," he said. Speaking during a visit to Salford, Mr Cameron warned there was a growing "cultural and social acceptance of violence". Typically, a deactivated gun has its barrel sawn down the middle and a metal rod is then welded inside to make it incapable of discharging a bullet. The breech block - which contains the mechanism to actually fire the bullet - is ground down so there is no firing pin. The proposal to make deactivated guns illegal comes after a huge increase in the amount of model and pellet guns converted to fire live ammunition. The police have said there are an estimated 120,000 in circulation in the UK. Also many replica guns can be easily converted to enable them to fire live ammunition. A Home Office spokeswoman said there are many types of replica guns, which can range from plastic toys up to metal ones which fire blanks. However, it is only the metal ones that police refer to when they discuss replicas being converted to fire live ammunition, she said. The Association of Chief Police Officers (ACPO) said it estimated that deactivated guns accounted for about 10% of all criminally used firearms. An ACPO spokeswoman said she welcomed the closing of a loophole in the law that allowed people to own deactivated weapons, even though realistic imitation firearms were banned in 2006 under Violent Crime Reduction Act. However, the most recent Home Office firearms figures from 2005/6 show that reactivated or deactivated firearms were recorded as being used in just eight offences, out of a total of 11,084. Reactivated handguns were used twice; deactivated firearms were used four times; and other reactivated firearms were used twice. There were, however, a large number of offences (4,989) in which the weapon was unidentified or unknown. Shadow home secretary David Davis said deactivated weapons accounted for a tiny proportion of gun crime. "The home secretary should realise that the public want a rigorous, long-term and holistic approach to the scourge of gun-crime, not ad-hoc announcements which will do little more than paper over the cracks," he said. Government ministers look set to reclassify deactivated weapons as replica guns, which are already banned. The move will affect weapons which were deactivated before 1995, when new standards made it harder to convert non-firing guns back into lethal weapons. Police say many firearms currently being used in crime were deactivated before that time. A Home Office spokesman said any new law brought in following the home secretary's announcement would relate "almost entirely" to pre-1995 guns. Ms Smith's visit to Liverpool comes as police raids saw 25 people arrested on suspicion of supplying Class A drugs in the Croxteth and Norris Green areas of the city. The Home Office is also to consider the implications for museums with collections of antique weapons. Gill Marshall-Andrews of the Gun Control Network said: "We are delighted, this has been on our agenda for a long time. It is a big loophole in our firearms legislation." But firearms collector Julian Tacon feared the proposals could have a major impact on legitimate collectors while being ignored by criminals. "It would affect many, many people and trade worth millions. I would be extremely concerned about that," he said. 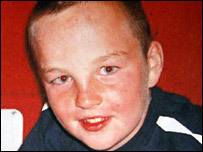 Rhys' parents, Stephen Jones, 44, and Melanie Jones, 41, held a private meeting with the home secretary. Rhys was shot in the neck and despite a number of arrests nobody has been charged with the schoolboy's murder. His parents have repeatedly called for the gunman to hand himself in.